I'm jeff from Uk but been in thailand for a while now. 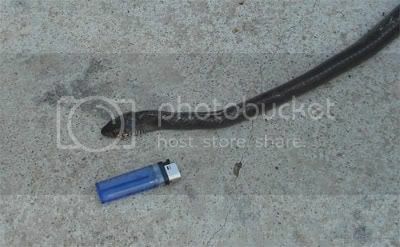 Just thought you might like to see a couple of pics of snakes that i have had close encounters with. 1. This is locally known a singa. Locals reckon a bite off these is quite serious. They are always around here, after the water rats and mice, frogs etc. Unfortuantly, when you see these you have to kill them as we have small children around here playing. 2. This snake i am not sure what it is, I think some type of cobra. But i was at the local shop top of the drive having a chat with a couple of swiss friends and i heard my dogs barking, came to the gate and could not see anything, but they just kept barking, unknown to me there was this thing on a window sill behind me, and i only knew when I heard it fall and I see it go behind a load of rubbish. hi mate - i will try to get back to you with some positive id's on those. any chance of some better pcis of the first one? it looks like it could be an elapid which is the dangerous ones essentially. 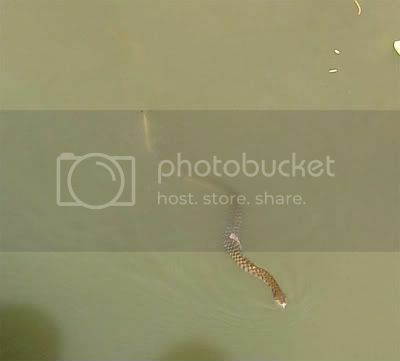 the second one looks to me like it is a colubrid of some sort fro mthe head pattern, as it does not look like there is a meaningful duvernoys gland - initial thoughts were elaphe taeniura - but as i say i will get positive i'ds on the way for you! 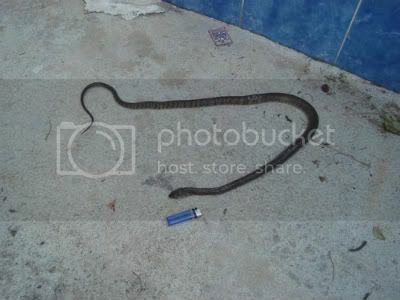 right mate - some details on snake 2. as i suspected it was a colubrid - Elaphe radiata or radiated rat snake. it is completely harmess - no threat to humans at all. 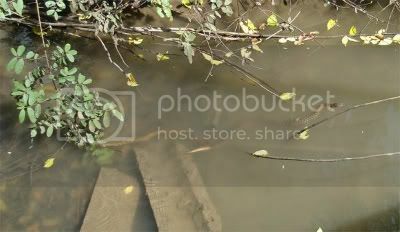 they feed on mammals, preferably rodents so they are in fact a very useful reptile to have around. they kill by constriction - not venom!! you dont have to take my word for it but if you are so inclined i will get hold of a captive specimen and then post a photo of the snake biting me - i am that confidant! Again a colubrid, this is a large rat snake (common name oriental ratsnake, common asian ratsnake etc) without venom. 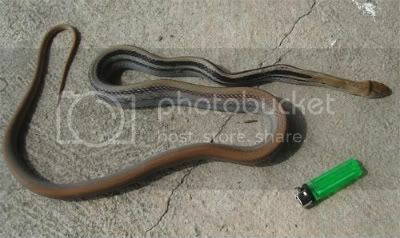 this species is totally harmless, whats more it is actually a beneficial snake as it is a rodent eater! i would urge you guys to leave these snakes alone. i respect that there are children around and their safety is paramount. however the truly dangerous snakes of the region, i.e the Vipers and Elapids (of which cobra's are included) are capable of death. however to kill them puts people at even more risk. The venomous snakes are able to strike vast distances, with some vipers even being able to jump. having worked with many dozens of species of snake i can tell you these snakes are very fast, and have a long strike range. to kill them means getting into its strike range - something far more dangerous than leaving it alone and getting the kids inside for a few minutes while it disappears. any more pics i would be happy to help out mate - and if you have any questions feel free! Thankyou for the info on the snakes, I have explained to my wife that the bottom one of the two is a copperhead ratsnake and non poisionus, but she is adamant. The link with the picture of the Thai man with the same snake to his head is taken from a snake farm / snake show website, there are many here mainly for the tourists but the Thai's go too, the sensationalistic headline 1 bite off this and your dead in fifteen minutes does not help the cause of these beautiful snakes, people with out knowledge of these snakes will think they are deadly when infact they are not. 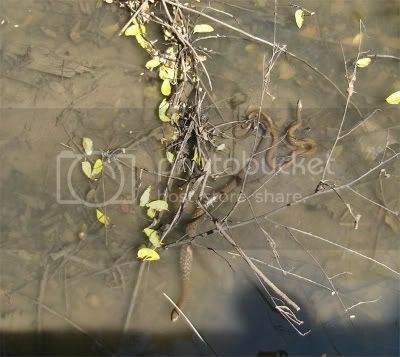 Like I mentioned before I have started to research the snakes in Thailand and I admire from a distance now. 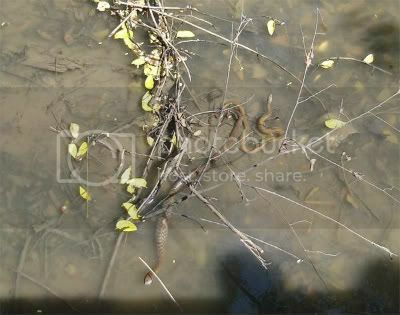 Here's a couple of pics of a couple of snakes mating in the stream that runs along the side of the house. Like I mentioned I'm not that clued up with snakes, so i am not certain what type they are. tell your wife about striking distance. it may be hard to believe but i have seen it happen on numerous occasions. to get close enough to kill a snake with anything other than a gun is incredibly dangerous and putting you well within strike range. furthermore, snakes are animals with pain perception. 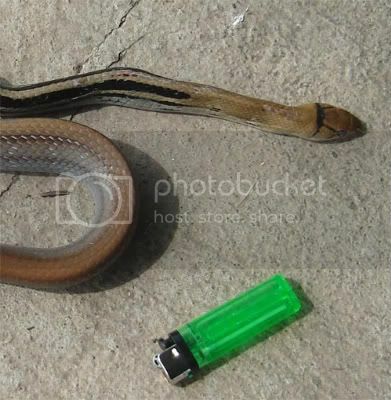 there is no humane way to kill a snake other than euthanasia. it is argued that even after decapitation snakes are still "alive" in so far as they are able to feel, understand, percieve, react etc as well as feel pain. i say leave em alone and they will leave you alone! and they are pretty useful as well, bearing in mind they predate on rodents!